Last month, I wrote about the most recent updates regarding the Takata airbag recall. Since then, a lot of information has changed, so much so that it is necessary to write a follow-up post. The reason this information is so important is because of the severity of the problem – whereas your airbag could launch shrapnel into your face like a shotgun blast. Also, the mind-blowing number of airbags being recalled is astounding. It is pushing nine million in the US, and nearly fifteen million worldwide. The reason for such a high number of recall is because, unlike most recalls that affect one brand or one model of car, this recall affects nearly a decade’s worth of automobile production – across five major brands. I won’t recap the entire backstory because you can find it here. Instead, I’m going to focus on some very fast moving and late breaking developments that could include the car you are driving right now. While Takata balks at the demands for a nationwide recall of vehicles equipped with its fatally flawed airbags, and the National Highway Traffic Safety Administration frets over what to do, automakers like Honda, Mazda, Chrysler and Ford are taking matters into their own hands. Honda, along with numerous other automakers, staff from Takata, and representatives from the National Highway Traffic Safety Administration, were called to testify before a U.S. Congressional committee last week. Following that testimony, Honda announced that it will expand its recall of vehicles equipped with Takata airbags, switching from a regional recall to a national recall. We applaud Honda for taking the initiative to replace airbags in all of its cars, and not just those in specific parts of the country. 1. Honda's spokesman, Ben Nakamura, confirmed that the recall expansion affects roughly 3 million additional U.S. vehicles. That would bring the total number of cars affected by Honda's airbag recall to more than 8 million. 2. Takata won't be supplying all the replacement devices. Instead, Autoliv, a developer and producer of automotive safety systems for all major automotive manufacturers around the world, will be the new supplier. This change to Autoliv is possibly because they want to speed up the recall process, especially since Takata would have to produce as many as 15 million new airbags that are no longer flawed (even though they still can’t figure out the cause of the flaw in the first place). Honda Motor Co. President Takanobu Ito said his company is planning to eventually launch a worldwide investigative airbag recall, just days after extending a similar callback in the United States. Ito also expressed frustration with the response of Japanese airbag supplier, Takata Corp., but said Honda will offer support if Takata tips into financial difficulties. “We cannot depend on Takata to find the cause,” Ito told Japan’s Nihon Keizei Shimbun newspaper in his first interview since the Takata airbag crisis abruptly worsened this fall. “We should have taken action based on the view that it’s a vehicle problem instead of a parts problem.” Ito’s comments follow Honda’s decision to extend a U.S. safety improvement campaign of driver-side airbags nationwide, after initially limiting that U.S. recall to only specific, humid regions. Mazda confirmed that it will follow Honda's lead and expand its recall of Takata airbags to the rest of the United States. There are also reports that suggest their recall will expand beyond the driver-side airbag, and will include the passenger-side airbags – though Mazda hasn't yet confirmed this as true. 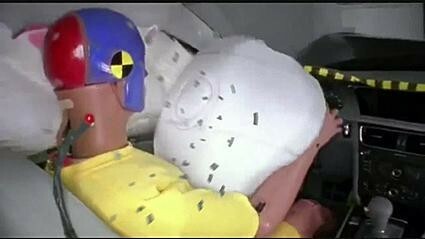 Nonetheless, this is significant, because many people are wondering about the rest of the airbags in their cars. All cars come with two front airbags, and many include several side curtain airbags as well. What if the passenger sides are also affected? Chrysler and Ford have expanded their existing recalls of vehicles equipped with Takata airbags. While both Chrysler and Ford have expanded their recalls to now replace passenger-side airbags as well, Chrysler says that it will now cover Ram 1500, 2500, and 3500 pickups from the 2003 model-year that were "sold or ever registered in Alabama, Florida, Georgia, Hawaii, Louisiana, Mississippi, Texas and the U.S. territories of American Samoa, Guam, Puerto Rico, Saipan, and the Virgin Islands". The 2003 Ram 1500 was already included in the airbag recall, but the scope had been limited to Florida, Hawaii, Puerto Rico and the U.S. Virgin Islands. The 2003-model 2500 and 3500 are entirely new additions. The expansion affects some 149,150 vehicle owners in the U.S., who should receive notification of the recall by mail around January 19, 2015. Those who have questions in are encouraged to contact Ram customer service at 800-853-1403. The expansion adds about 13,000 vehicles to Ford's U.S. recall roster. That brings the total number of recalled Ford vehicles to 98,000, 38,500, of which are registered in the U.S. 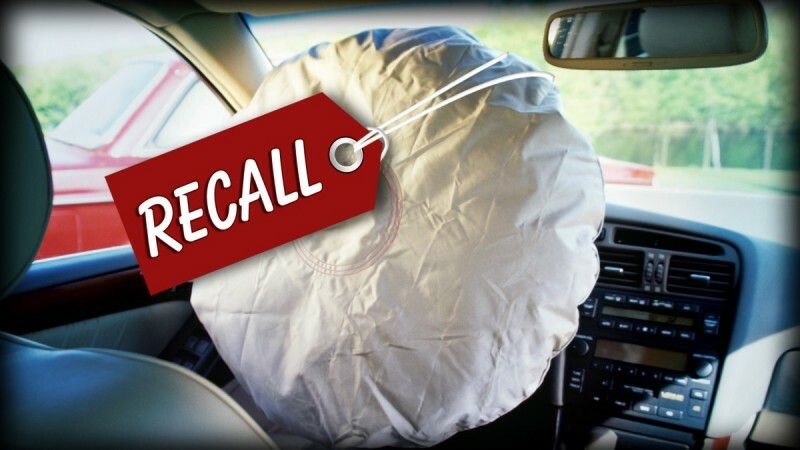 This recall does not affect only cars with previously installed Takata airbags. If your car was ever in an accident where one or more of your airbags had to be replaced, contact the auto body repair shop that performed the work. 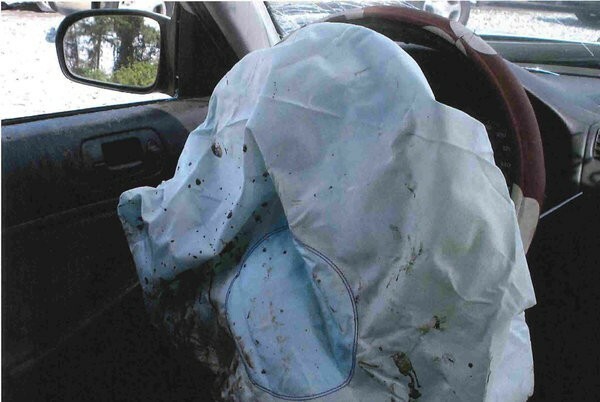 See who made the replacement airbag, and to find out what to do if the bag had been recalled. This is a continually evolving story, and each week more vehicles are added to the recall list. If your car wasn't listed last week, it could very well be on the list this week, or even in the future. Our advice is to continue to monitor this story, or check back on our blog for new information. If you own any one of these vehicles, please call your local dealer today to see if and when you will need to bring your car in for a recall.